If you are living with feelings of dread and as though you are on edge you are more and likely to be living with anxiety. These symptoms of stress and anxiety may result in you withdrawing from your family and friends or finding going to work can be unbearable increasing your stress level. It can also have a knock on effect on your confidence level and self-esteem. Feelings of fear with the constant thoughts running through your head means you are unable to turn off during the night or day. You will find with these symptoms of anxiety that you are unable to relax. Episodes of anxiety can lead to you feeling dizzy, having a dry mouth or feeling sick. 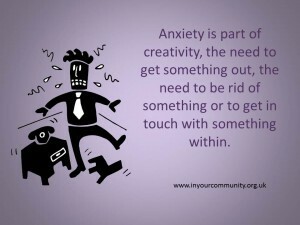 Often people find it is helpful to find the root cause of the anxiety or finding professional help to dealing with their anxiety. This counselling blog post will discuss alternative ways of finding ways to relieving the anxiety with activities that will bring you enjoyment. Sit down with a piece of paper and draw or doodle. Drawing is a useful way of expressing what you are feeling or creating a distraction. Children enjoy drawing and expressing themselves, so why can’t adults? I often use drawing in my counselling sessions when people are unable to express our feelings as it is a useful way of exposing the raw feelings. The quality of your drawing is not important. It is putting your thoughts onto paper in art. Drawing is a creative way of escaping and relaxing you. You might also find you art and want to start attending classes. For 30 minutes a day, listen to music you enjoy. You might wish to find music that matches your mood or music that relaxes you. Music can bring positive feelings in you and increase your mood. I recommend, if it is not classical music, that you try singing to the music. Signing can also bring out emotions and help relax you. Again just like art and writing, you may find it is your way of relaxing and want to pursue it further. Signing clubs are widely available and can help you get out of the house. Walking is great exercise and gives us fresh air and excercise. Walking is a helpful way of relieving anxiety especially if you have the physical symptoms of short breathlessness or chest pains. Walking can change the way you breathe. Walking can also distract your anxious thoughts. You may wish to try mindful walking. Walk in silence and focus on your surroundings. This may help take away your thoughts of anxiety. All the above activities are free and can be enjoyed on our own or in your own home. It will not solve the problem of anxiety but is certainly a step to helping relieve your anxiety and you never know you may find a new hobby that you enjoy. Hazel provides counselling in Sheffield and online counselling and can help with anxiety and stress.